the BEst people doing the best work for nearly 100 years. Cooney Lees Morgan is a full service law firm based in Tauranga, New Zealand. Founded in 1918, the firm has grown to become one of New Zealand’s leading law firms. Currently there are over 90 staff, including 48 lawyers and 9 senior partners. The firm is organised into four teams specialising in Property & Development, Litigation & Local Government, Corporate & Commercial and Private Client & Trust. In the 21st Century people are making different choices about where they live and how they work. There’s a new ‘lifestyle economy’ emerging and – not surprisingly – Tauranga, where Cooney Lees Morgan is based is at the very hub of that movement. 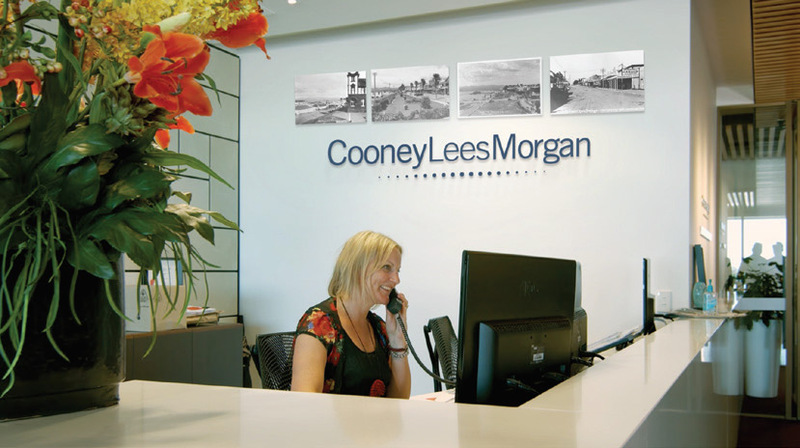 Cooney Lees Morgan works with the people, businesses and local authorities who have made the Bay of Plenty region what it is today, and who are shaping its future. Beyond those regional boundaries, the firm has developed key working relationships with clients across New Zealand, and around the world. Cooney Lees Morgan represents the epitome of the successful Kiwi midsize law firm. At the core of the business are local roots, and clients whose association with the firm stretch back generations. At the other end of the spectrum, the ‘new bloods’ have gone out and taken on the world with confidence and vigour, exposing the firm to business opportunities that have pushed the firm to evolve and grow. Today, it’s the way Cooney Lees Morgan moves seamlessly between legal work of all magnitudes that defines the firm. Nobody’s been left behind as the firm has grown and expanded its horizons. The fact is, first home buyers and corporate giants live side by side at this firm and that’s something the partners are incredibly proud of. Regardless of where the future takes the firm, there is one thing that will never change. Choosing Cooney Lees Morgan will always mean you have the very best people working for you. Cooney Lees Morgan was founded by Owen ‘H.O.’ Cooney in 1918 and today three of his grandchildren are among the firm’s partners. From the beginning, the firm has been closely associated with the growth of the region. In 1918, when the Cooney Lees Morgan story begins, Tauranga was a modest town. The 1916 census recorded a population of just 1,685. There was a fish factory, a few citrus orchards around Te Puke and the early stages of a dairy industry. There was no railway – Auckland was an overnight sea voyage away, on the twice-weekly steamer Nga Puhi which left from a wharf jutting out from The Strand. Of course, you could get to Auckland by horse, and that’s how local school teacher Owen – everyone called him ‘H.O.’ – Cooney would travel, whenever he had to go up for another exam on his way to becoming a lawyer. They say he soaked up the books, and would practice his courtroom skills in the classroom, creating a moot court with his pupils. In the 1930s H.O. was joined by Andy Jamieson. Andy soon took over the Te Puke office and H.O. opened the Tauranga office, in Willow Street. By 1940 Tauranga was starting to boom, but there was a war on and Andy Jamieson, among others on the firm’s staff, enlisted. H.O. persuaded Lionel Lees to come and help him. Tauranga-born, Lionel had also trained in Auckland and was Crown Counsel there before returning to look after the family farm in Papamoa. Reluctant to take a job from those in service, Lionel took some convincing, but gave in when H.O. simply painted his name on the front of the building. Andy Jamieson never did return – he was killed in Crete in 1941. H.O. Cooney and Lionel Lees were extremely active in the development of the region. H.O. was mayor of Te Puke for a while and an advocate for local Maori over land grievances. Lionel served on the Tauranga council and was deputy mayor, as well as being on the Fire Board and the committee that established the University of Waikato. Overcoming opposition from Auckland and Whakatane, and from the Chief Engineer from Wellington, H.O. argued the case for a new port for Tauranga and Lionel served on the new Harbour Board. After the war, H.O.’s son, Jim, joined the practice. The war and family had prevented Jim from completing his law exams, but, as a major in the army he had honed some strong negotiating skills and he applied these to great effect in a number of land compensation claims. In 1948, the name of the firm was changed to Cooney, Jamieson, Lees. Meanwhile Ed Morgan (actually Eugene Dennis, but E.D. became ‘Ed’) was in Malaya, as part of the post-war colonial government. He’d been a prisoner of the Japanese during the war and survived three horrendous years building the Burma railway. When he returned to New Zealand in 1950 he was encouraged by a former law professor to “Go to Tauranga and learn your craft” from H.O., which he did. Another of H.O.’s sons – Des Cooney – a well-known sportsman who represented Auckland, Bay of Plenty and New Zealand Varsities at rugby, also joined the firm. Des developed an extensive property practice and took up responsibility for managing the firm, embracing new ideas and new technology and overseeing a significant expansion. The firm moved to new premises in Grey Street. Ed Morgan, meanwhile – who, like H.O., was an outstanding barrister, no happier than when fighting for a cause – was taking over H.O.’s Maori work, helping, among other things, to secure compensation for the land taken after the 1864 Battle of Gate Pa and later taking part in the land march alongside Dame Whina Cooper. The name of the firm changed again, to Cooney Lees & Morgan. At Cooney Lees Morgan our goal isn’t to be the biggest employer or have the biggest turnover, it’s to have the best people. Find out more about what it’s like to work at Cooney Lees Morgan.